Usually I start a new year by posting smoothie bowls, salads and all of my favorite light and fresh things, but… well… it’s -3 degrees outside here in Chicago so I thought I’d start this year off with my favorite hearty, healthy, and most importantly warming recipes that you might want to make for dinner this week. The title kind of says it all – this recipe includes an easy lemony white bean puree that’s made with ingredients that you probably have in your pantry right now. Pour it over brown rice pasta shells and tons of sauteed broccoli. If you got a spiralizer for Christmas, now’s the time to break it out! 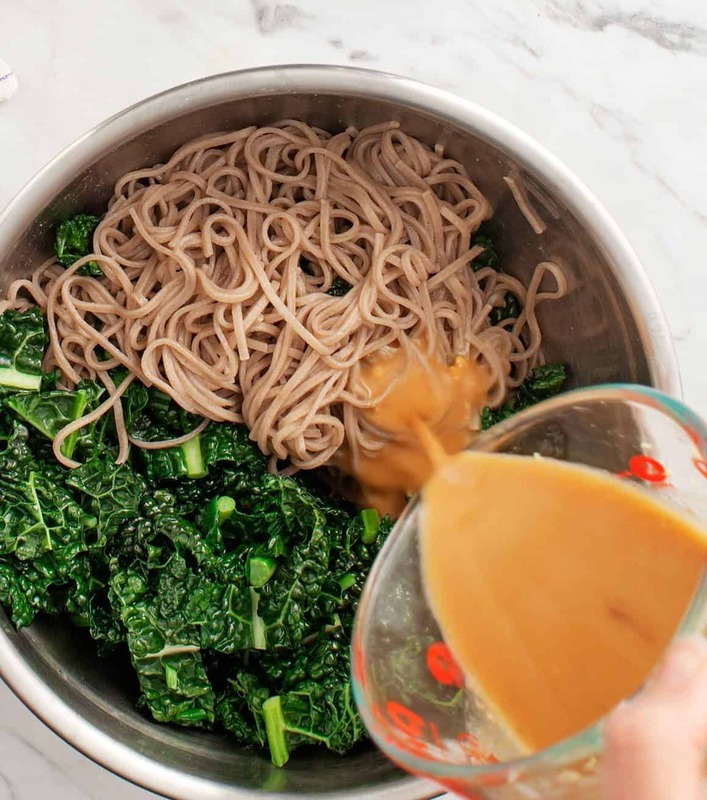 Noodle some sweet potatoes and toss them in a pan with tons of kale and garlic for a quick veggie-packed dinner. One of my favorite recipes from our cookbook, these enchiladas are perfect to eat for dinner when it’s cold outside. They’re stuffed with roasted butternut squash and black beans and they’re topped with a smoky chipotle tomato sauce that will take you only a few minutes to stir together. Make these quicker by roasting the butternut squash in advance! (note: the photo above is the step before they go into the oven). Obviously, I’m craving spicy things today! Tortilla soup is one of my favorite soups, but it’s rarely served vegetarian at restaurants so I make my own. This hearty soup has a tangy & smoky broth, plus a fun crunch from the tortilla strips. It can be made with butternut squash instead of pumpkin if that’s easier to find. This is one of my favorite recipes that I made this past year. If you love mushrooms, you HAVE to make this pasta dish. Even though it seems very simple, it’s big on flavor because mushrooms and tarragon are a match made in heaven. A touch of cashew cream with Dijon mustard makes it just a little creamy and oh so luscious. Ok, if I had to pick TWO favorite recipes from 2017 this may be my second favorite. That butternut squash looks fried, but looks can be deceiving – it’s coated with crispy hemp seeds and panko and baked. The creamy poblano sauce takes these tacos over the top. Based on how many times I’ve seen this one tagged on Instagram, I’m assuming that this creamy broccoli soup is a fan favorite. Traditional cheesy broccoli soup is so very unhealthy, but my version packs a ton of vegetables and is husband-approved. A super hearty pasta made with lentils and mushrooms instead of meat! This sauce in this recipe is so good! Pour it over noodles, lots of kale and any vegetables you like. You can serve these noodles hot or cold. Keep extra sauce in the fridge for flavorful lunches! When I truly need a reset meal, this is what I make. Brown rice, steamed vegetables, some kind of legume (pictured: mung beans), a little sauerkraut or pickled ginger, and a turmeric tahini sauce to bring it all together. I hope that this one proves that eating healthy is not at all boring! For those cold nights when you really don’t want to cook much – roast some sweet potatoes and stuff them with one of these filling options! Let me know if you have any dinner recipe requests for 2018!